Wortwell is a small parish, with an area of 4.6 km2, situated in the South Norfolk local government district. To the south the parish is bordered by the River Waveney, the county of Suffolk lying on the other side of the bank. The southern part of parish is criss-crossed by drains, and there are several areas of standing water near the pumping station to the east of the village. The centre of the parish is cut by A143, and there are small areas of wood to the north. Evidence for the prehistoric period in Wortwell has been recovered from the surrounds of the village, and includes a mound of potboilers and burnt flint (NHER 11055), and a possible Bronze Age double ring ditch (NHER 17824). A surprising number of worked flints have also been recovered, predominantly dating to the Neolithic periods (NHER 24247, NHER 24248). A borer (NHER 24462) and an axehead (NHER 24600) are among some of the more interesting, as well as an Early Neolithic or Mesolithic flaked axehead (NHER 44455). There is little evidence of Bronze Age or Iron Age activity, although a possible Iron Age terret (NHER 28209) was recovered from an area just south of the village. However, objects from the Roman period have been recovered from areas across the parish. A number of sites have pottery sherds (NHER 10771, NHER 11049, NHER 29150), coins (NHER 32174, NHER 29150, NHER 29152), and metal objects such as a Roman duck brooch (NHER 28209). There is also evidence for the occupation of Wortwell during the Saxon period, scattered to both the north and south of the village. This includes an Early Saxon ring (NHER 28209), pottery sherds (NHER 31000), and two Middle Saxon brooches (NHER 32780). Interestingly, Wortwell does not appear in the Domesday Book, and does not appear to have been a parish until the 1885 boundary redistributions. The hamlet of Wortwell seems to have been part of Mendham parish, an odd parish that had a section in Suffolk as well as Norfolk. In 1885 the land was redistributed, the Norfolk part of Mendham being split between the new parish of Wortwell and its neighbour to the west, Redenhall with Harleston. Interestingly, this redistribution resulted in the land of the parish church of Redenhall, St Mary’s (NHER 11104) being split between Redenhall and Wortwell. Only the tower is in Redenhall, the majority of the building falling under the Wortwell parish, although as Wortwell is ecclesiastically united with Redenhall, and has no parish church of its own, this is a convenient situation. The church itself (NHER 11104) was begun in the 1460s, and largely paid for by the De la Poles, one of the richest families in East Anglia during this period. As a result it cuts a rather imposing figure, situated above the road and benefiting from a massive Perpendicular style tower. Inside, the church has an interesting brass lectern in the shape of a double eagle and made around 1500 in East Anglia, as well as some puzzling farrier symbols carved into the late 15th century west door. It can be assumed that the village of Wortwell was probably a small settlement during the early medieval period, however there is a small amount of evidence for this period. Just to the south of the village is an area (NHER 29152) from which a large number of medieval pottery sherds and metal objects have been recovered, derived from an area of dark soil, and this has led the site to be interpreted as part of a possible medieval settlement. There is also a possible medieval moated site (NHER 11101), just 350m to the southwest of the possible settlement (NHER 29152), and it is likely that the moat around the 17th century Wortwell Hall (NHER 11102) predates the building. A number of objects from the medieval period have been recovered, largely dominated by pottery sherds (NHER 24600, NHER 24247, NHER 31000), although other objects such as coins (NHER 23273), fittings and ornaments (NHER 29152), and two medieval copper alloy seal matrices (NHER 31939, NHER 32174) have also been recovered. Similar objects from the post medieval period have also been retrieved, including coins (NHER 32780, NHER 28209), pottery sherds (NHER 31000, NHER 29150), as well as metal objects such a seal matrix (NHER 33218), and horse harness pendants (NHER 32174) have also been recovered. Of particular interest is a hoard of eighty-two silver coins (NHER 28908), dating to between 1526 and 1643, and buried during the Civil War. There are over twenty buildings of interest from the post medieval period, and these are almost exclusively located along or near to the High Road and Low Street that form a snaking route from the northeast boundary, through the village and south towards St Mary’s Church (NHER 11104). 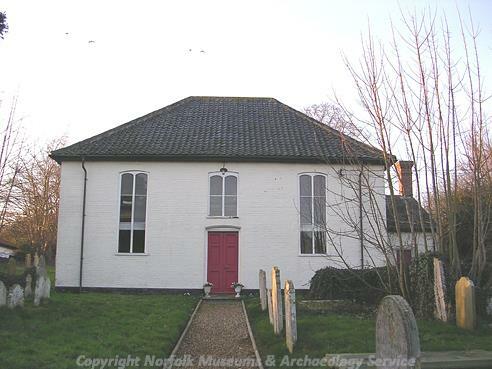 Of these Church Farmhouse (NHER 22557) is a representative example; built in the 17th or 18th century its timber framing is hidden behind a red brick skin of the 19th century. There are also a number of later buildings, such as the 18th century United reform Church (NHER 34948) and the 19th century Old Manse (NHER 48470), a two storey stuccoed house of the 19th century. Evidence of Wortwell’s industrial heritage has also been preserved in the form of records of the sites of windmills. These records indicate the presence of two windmills in Wortwell during the post medieval period (NHER 16392, NHER 17824), both situated to the south of the village either side of the High Road. 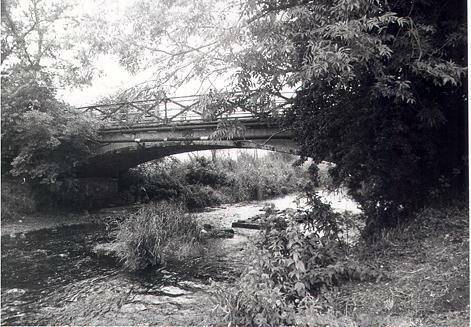 Also of the same period, and of particular interest, is Homersfield Bridge (NHER 24371). Homersfield Bridge is a precast concrete and cast iron arched bridge built in 1869 with a wrought iron parapet and decorative features including a coat of arms of the Adair family of Flixton Hall. It may be the earliest bridge of its kind in the country. It was built on the site of an earlier wooden bridge, and restored between 1995 and 1996. It sits on the river just south of the modern bridge, and carries the road that divides Wortwell from its neighbour to the north, Alburgh. It takes its name from the village just across the river to the east, Homersfield, in Suffolk. Also worth mentioning is the former Baptist and later Roman Catholic chapel on the Low Road (NHER 11103). This building was initially built as a Baptist Chapel in 1822, and was used from the 1980s as a Roman Catholic chapel of St Mary, which led to the removal of the pulpit. By January 2000 it had become moribund, and is now a private residence.